Final resting place. | Scuffalong: Genealogy. Final resting place. – Scuffalong: Genealogy. 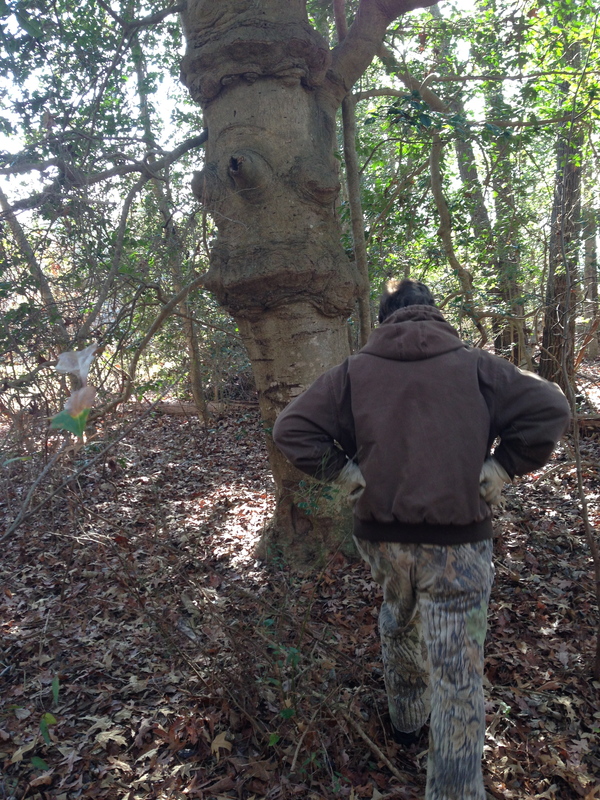 Following her directions, I knocked on the house of a door perhaps a quarter-mile down Turner Swamp Road. J.S. answered with a quizzical, but friendly, greeting, and I repeated my quest. Minutes later, I was sitting in J.’s back room, waiting for him to change shoes and look for me some gloves and find the keys to his golf cart. 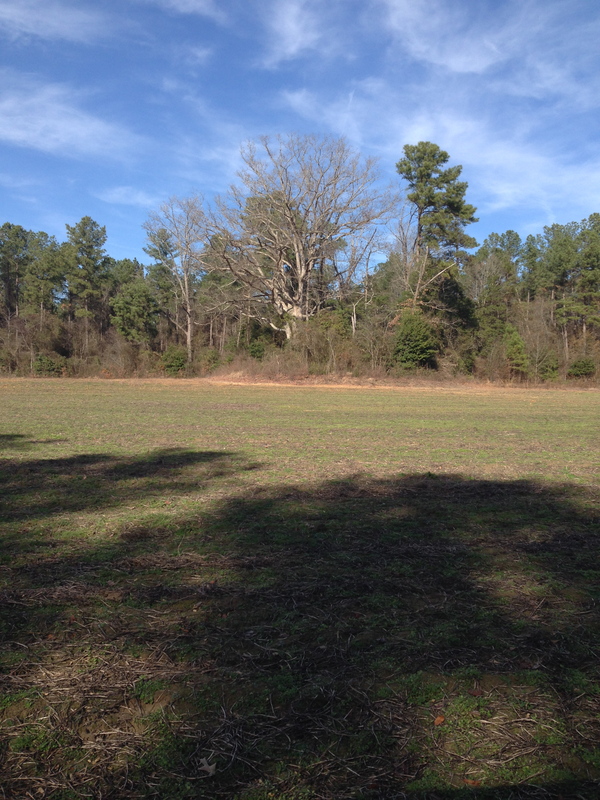 We bounced along a farm path for several hundred yards, then followed the edge of the woods along a fallow field. Along the way, J. told me about his family’s long history on the land, and the small house and office, still standing, in which his forebears’ had lived. As we approached the final stretch, he cautioned me about the briers that we were going to have to fight through and pulled out some hand loppers to ease our path. 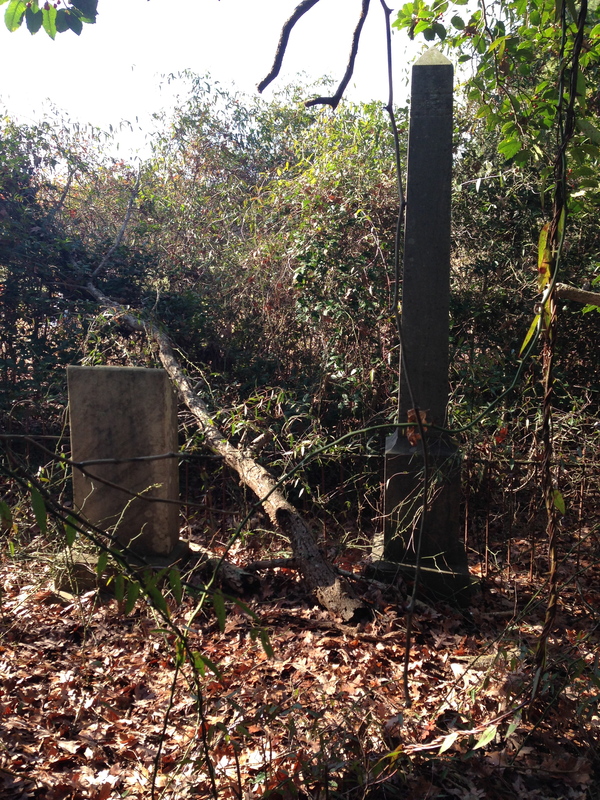 The cemetery, he said, was there — in that bit of woods bulging out into the plowed-under field. 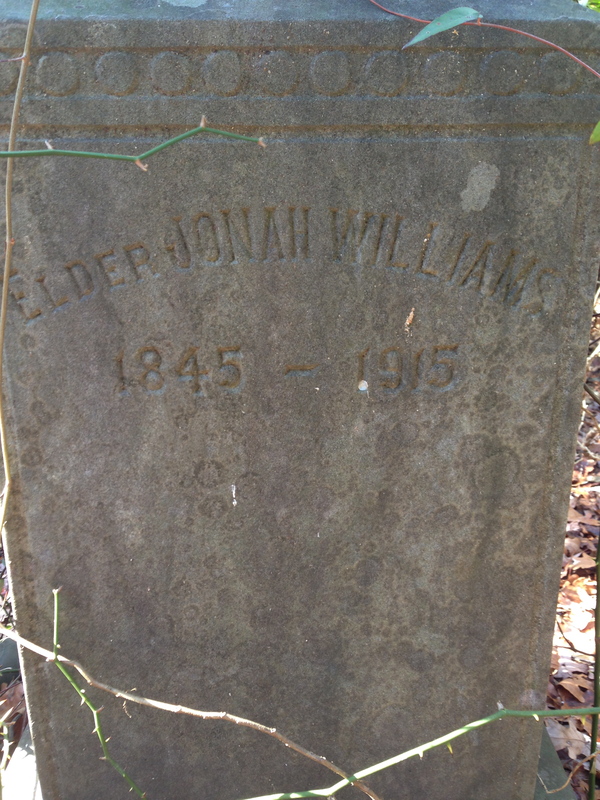 Elder Jonah Williams, brother of my great-great-great-grandfather Adam T. Artis. At his side, wife Pleasant Battle Williams. And his children Clarissa, J.W. and Willie nearby. 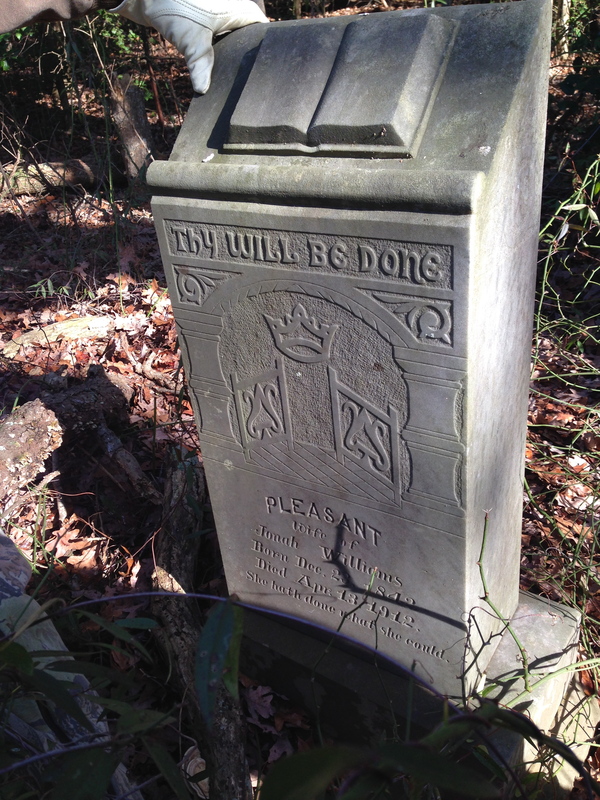 In Glimpses of Wayne County, North Carolina: An Architectural History, authors Pezzoni and Smith note that the largely forgotten graveyard was believed to hold the remains of members of the Reid family. This is quite possibly true as Reids have lived in this area from the early 1800s to the present. As I followed J. through the brush and my eye grew accustomed to the contours of the ground beneath us, I could see evidence of thirty to forty graves, and there are likely many more. Had this been a church cemetery? Was Turner Swamp Baptist Church (or its predecessor) originally here, closer to the banks of the creek for which it is named? If this were once the Reid family’s graveyard — known 19th and early 20th century burial sites for this huge extended family are notably few — how had Jonah and his family come to be buried there? I am indebted to J.S. for the warmth and generosity shown to a stranger who showed up unannounced at his doorstep on a chilly December day, asking about graveyards. I have been at the receiving end of many acts of kindness in my genealogical sleuthings, but his offer of time and interest and knowledge — and golfcart — are unparalleled. He has invited me back anytime, and I intend to take him up on the offer. ← “That’s your wife.”; or, finding the Perrys. That’s so amazing to find this place. The headstones were so beautiful back then. I love all the photos you post, Lisa. Thanks so much, Tammi! Jonah Williams and “your” Daniel Artis were first cousins. Oh thanks for that information! I have a hard copy from my cousin John, of an inventory sheet left from my gg-Aunt Angelina Lane’s estate where it shows Daniel bought some of her things like a jug and one other item after they had put her stuff up for sale. So that was so interesting to me to know he was there those many years later in the area. Hey, you know the whole estate file is available at familysearch.org? Not only did Daniel purchase, but so did his cousin Isaac Sauls and cousin-in-law Henry Edwards! Wow! Thanks, Tammi. Looking forward to getting it! Pingback: First bale of cotton. | Scuffalong: Genealogy. Pingback: Nothing could swerve him. | Scuffalong: Genealogy. Pingback: He was faithful in all his houses. | Scuffalong: Genealogy. Pingback: Jonah Williams and the Turner Swamp Primitive Baptist Association. | Scuffalong: Genealogy. Pingback: Where we lived: Adam Artis’ Eureka. | Scuffalong: Genealogy.